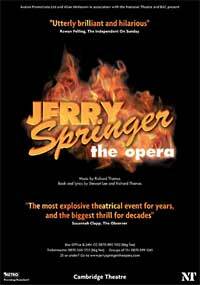 Back in January there was quite a rumpus when BBC Television screened Jerry Springer – The Opera by Stewart Lee (writer) and Richard Thomas (composer). Almost 50,000 people complained about the 8000 obscenities in the opera, and there were protests by a number of religious groups. Among the objectors was BBC Radio 3 producer Antony Pitts who resigned his job in protest about the alleged blasphemous content in the broadcast. Among the programmes Pitts worked on was the highly acclaimed, and cutting edge, Late Junction. But Antony Pitts didn’t disappear as a footnote in history. He has a flourishing career as a contemporary composer, and the new Hyperion recording of his choral work Seven Letters has been selected as Editor’s Choice in the August edition of the prestigious Gramophone magazine. And the story doesn't end there. The chamber choir, Tonus Peregrinus, that he founded and directs is gaining quite a reputation with its recordings of both new and medieval music. Antony Pitts (see photo) was born in 1969, sang as a boy in the Chapel Royal, Hampton Court Palace, and was an Academic Scholar at New College, Oxford. His recent commissions include works for the Berlin Radio Choir, Cambridge Voices, the Clerks’ Group, the Choir of Westminster Cathedral, the London Festival of Contemporary Church Music, Oxford Camerata, Schola Cantorum of Oxford, and the Swingle Singers. His choral music is jazz influenced (note the Swingle Singers connection), but retains strong links to traditional musical forms, and reflects his own personal beliefs. Antony Pitts seems to be having the last laugh on the Jerry Springer – The Opera affair as his highly acclaimed new work Seven Letters is a choral setting of St John’s damning indictment of the depravity of the first-century church in Asia Minor from the Book of Revelations. It was composed in 1998, and is scored for SSAATTBB. The writing is both contemporary and accessible, and all credit to Hyperion for investing in new choral music. The complete sleeve notes are available through this link. Find out more about Seven Letters by listening to four minutes from the new recording using these buttons. Let us know what you think of Antony Pitts' music based on this short sample by adding a comment through this link. And why not share this exciting new music with a friend or colleague by emailing them a link to this post including the music by clicking here? Seven Letters is sung by Antony Pitts' own group Tonus Peregrinus shown in the adjacent photo. (The name is from a form of plainchant). The group's repertoire spans 800 years, and they created a classical best seller with their Naxos recording of Arvo Part’s iconic Passio. But the recording I want to share with you is their new Naxos release of medieval sacred music from Notre-Dame Cathedral, including works by Leonin and Perotin. This budget priced CD is one of the most rewarding I’ve heard for years. It was recorded in Chancelade Abbey, outside Perigeux in France. The sound is atmospheric (including the distant sound of rain falling in some takes) and vivid, and the singing is both technically excellent and really moving. Try it, even if, like me, you may have found these medieval composers a little ‘hair shirt’ in the past. The opening track with Rebecca Hickey singing Perotin’s Beata viscera contains six minutes of the most ravishing sounds you will ever hear. I can’t link to the Naxos audio clip of this recording because registration is required. But take my word, for around £5 ($9) you just can’t go wrong. Very intriguing music; I enjoyed the sound-clip. I must say that I'm neither an early music scholar or buff, but I do enjoy both...Currently, my favorite choral composer is Erik Whitaker. Thanks for sharing this new music! Re the previous helpful comment. I hadn't heard of the composer Sophia mentioned. So I am indebted to a US source for the following information. The correct spelling is Eric Whitacre. He is an American choral composer and conductor who was Juilliard-educated and somewhat commercially successful. His a cappella music is particularly popular with some audiences. He also wrote an "electronic" opera on Paradise Lost. One of his most popular CDs is with the Brigham Young University chorus, of Utah, and he may have connections with the Mormon Church there. hey, pliable, that last link you give also contains a MP3 to Eric Whitacre's song “With a Lily in Your Hand” from his Three Flower Songs. So your readers will have two chances to sample younger composers takes on new sacred music. Sophia, DON'T be embarrassed. Your post achieved exactly what I started this blog for. As the post before your one above highlights, your comment has cleared an overgrown path to a contemporary composer many of us have never heard of. And now, thanks to my anonymous source quoted above, all of us can sample Eric Whitacre's work. That is ALL that matters on this blog. The many errors I have made on this blog include converting UK pounds to US dollars at 1.8 to 1 instead of 1 to 1.8! And my constant corrections and refinements drive RSS users mad as they get mutiple versions of the same post. But despite all this madness it seems to work. More comments on Seven Letters, and more steers to other worthwhile contemporary composers (however spelt) very welcome here. And anyone that has got this far down these comments (for which you deserve a medal), you MUST visit Sophia's exquisite blog Philosophia, one of those rare blogs that combine form and function. Sophia, don't feel bad about your spelling-- last night I heard live Eric Whitacre's beautiful four minute motet "Lux aurumque (2000)", which is on the choral CD that you probably heard, and the short program note spelled his name BOTH Whitaker and Whitacre!! Some useful information from Seven Letter's composers Anthony Pitts following my post. Particularly interesting in Tallis anniversary year is his choral work XL commmissioned as a companion piece to Spem. it is scored for eight choirs, SATBarB, BBarTAS,BBarTAS, SATBarB, BBarTAS, SATBarB, SATBarB abd BBarTAS. The Faber published score gives three alternative layouts for the choir. A recording on Harmonia Mundi (HMC801873) has just been released. An interesting new option for programme planners who are scheduling the Tallis 40 part motet? The next Tonus Peregrinus release on Naxos is a CD of works by John Dunstable - look out for that! And Antony is currently working on a commission for an Advent motet for King's College, London. Keep the information coming in! Thank you for your forgiving comments and for your support of my little blog! I just started it here at a music festival I'm playing in, and it's been a fun little hobby so far. With my undergraduate choir, I performed Eric's "I Thank You God For Most This Amazing Day" and worked on "Water Night". I've heard "Leonardo Dreams of His Flying Machine" performed as well...This is how I was first exposed to his work. What I love most about his music is the sonorities he creates from layering and clustering pitch. pliable, thank you for giving the info on Anthony Pitt's Thomas Tallis Commemoration piece (XL). I recall that my latest Harmonie Mundi sampler had an excerpt from that CD -- a choral work excerpt by Jonathan Harvey, not by Anthony Pitt. You remedied that yesterday in your post. Sophia, its interesting that you're currently involved with learning a work by George Crumb. Did you know that Crumb is the composer in residence at this year's Salzburg Mozarteum Sommerakademie (part of the famous Salzburg Summer Festival)? Mystery and Exultation. A Cycle of American Civil War Songs, Folk Songs, and Spirituals. Ann Crumb will be the soprano soloist in Volume I and Barbara Ann Martin will be the soprano soloist in Volume IV. This Philadelphia ensemble is this year's only American participant in the Festival. Their concert will be, in Salzburg, on August 4 -- next week. All four volumes of Crumb's American Songbook are scored for soprano, amplified piano, and percussion quartet. More than 100 different percussion instruments are required for the two works! (Tell your percussion friends!) You should be on the lookout for all of Eric Bruskin's expert program notes to the works of George Crumb -- including I imagine, Voice of a Whale. That's very exciting news about George Crumb! I do indeed enjoy his works, although sometimes they are a bit creepy (Makrokosmos and parts of "Voice of the Whale"). :)Last year, he was the guest composer at the festival I'm currently at...This year's composer is Bright Sheng. One of my coaches right now - Simone Fontanelli, is a contemporary chamber music professor at the Mozarteum University in Salzburg! What a small musical world we live in. Thanks for letting me know about Crumb in Salzburg; I'll be on the lookout for the Mozarteum Sommerakademie! You can listen to a sample of Antony Pitt's XL by opening this link. thanks, pliable, I was curious about Antony Pitt's 40 voice XL but wasn't ready to spring for the full CD that has several works that I already know and have. No you can't. After posting the comment I realised the audio sample was from the Knut Nystedt work, not XL. Bit daft of Harmonia Mundi as everyone is interested in XL. Amazon.com there is only one copy now left in stock! !